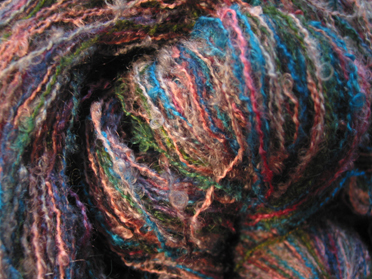 1,000 yards of Mohair, however, takes a VERY long time to wind into a ball by hand. I’m only halfway through. 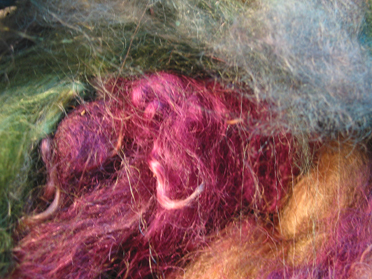 Then I had to indulge my curiosity about needle-felted creatures that I’ve been seeing around on eBay, so I got some pretty dyed roving from another booth, a very small amount, and two felting needles, one of which broke as soon as I got home. Oops. Anyway. 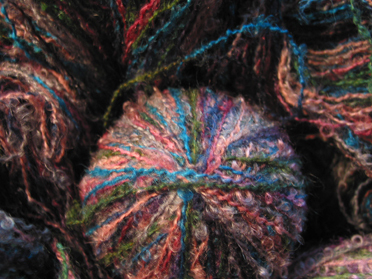 Here’s the roving, all rainbow-y – there are more colors than the photo suggests. If I ever manage to get anything vaguely animal-like out of my endeavors with that, I’ll let you know. 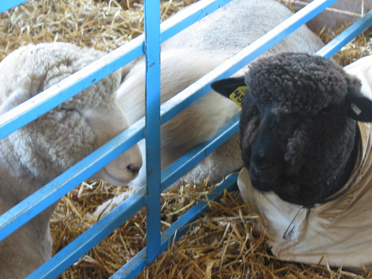 I then walked past the booth for Persimmon Tree Farm, and stopped. And stared. 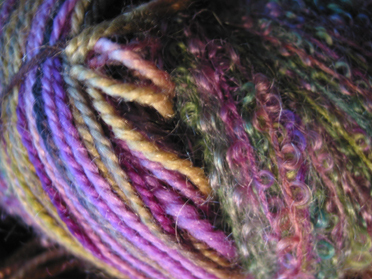 And wished with all my might that I’d had a) my camera, and b) the ability to spin roving into yarn. Because she had this stuff – this cloudy puff of exquisitely colored softness in a bag. It was called Fall Harvest with Glitz, and it was just what you’d expect it to be, with copper metallic fibers strewn in here and there. It was glorious, and I am still kicking myself for not getting it when I had the chance, lack of spinning knowledge be DAMNNED. I am SO. not. making that mistake next year! 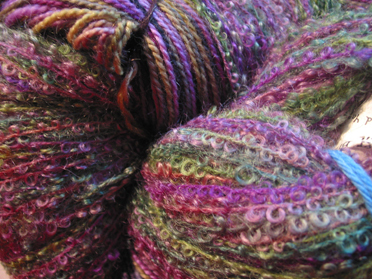 Greta, the spinner/dyer in question, is going to do another batch of the colorway, although she cannot of course guarantee the same hand, color combos, etc. Still, she’ll try, and if it’s even CLOSE, I’m buying! Which brings me to Sunday! Having my (tolerant, wonderful, adored-beyond-measure, sick-at-home-today) husband along made all the difference, as did (I think) the fact that it was the second day of the festival. 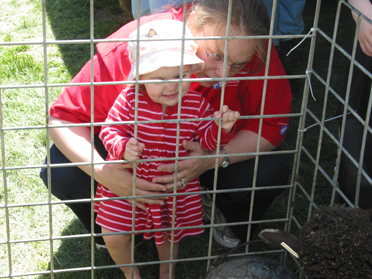 Look at my beautiful baby and cute hubby – am I lucky, or what? (even if you don’t agree, smile and nod. I’m not rational about this one thing.) 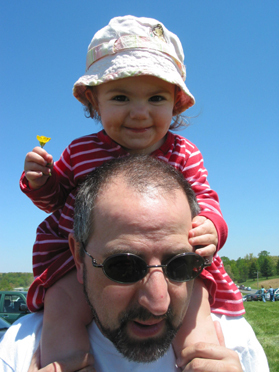 My poor husband will kill me for posting such a badly posed picture on his part, but I don’t care – I still think he looks a little like Jean Reno in those sunglasses. Je t’aime, mon amour! Your daughter is seriously cute! I wouldn’t just say that either. I’m very jealous that you got to go and look at all that loveliness. 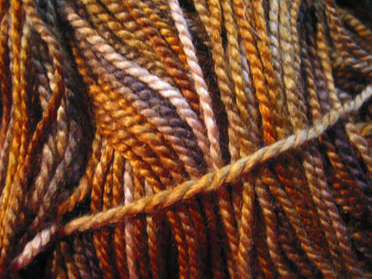 Someday…..
Like the combo of yarns. The colors are perfect together. You think your daughter is being cute, just wait til she learns to knit and raids YOUR stash! Heehee! That look on her face is priceless. 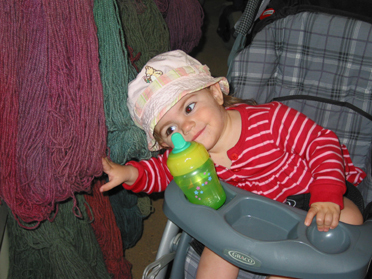 What awesome pictures of Sophie– and the yarn ain’t bad, either. I am SO jealous. It’ll really be fun this year to see what is created from everyone’s purchases. I guess that my mission for now is to live vicariously…. Your daughter is adorable! Does she always have that cute little smile on her face? Love the photo of her and your hubby.